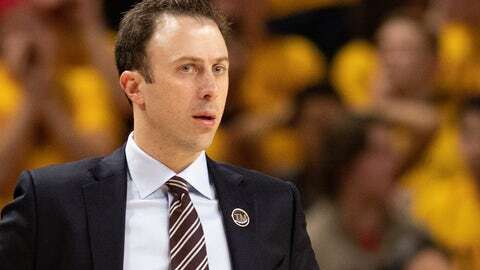 MINNEAPOLIS — Minnesota coach Richard Pitino has agreed to a two-year contract extension through the 2023-24 season, following his first NCAA Tournament win in six years with the Gophers. The university announced the deal, which is subject to approval by the board of regents, on Sunday. Pitino’s annual salary was increased to $2 million, up from about $1.7 million this season. Giving major-college coaches at least five years of contract runway is a common practice to help sell stability to recruits. Pitino has a 112-91 overall record at Minnesota, with a 40-70 mark in Big Ten Conference play. He led the Gophers to the NCAA Tournament in 2017 and 2019. This year, the Gophers were a No. 10 seed in the East Region, beating Louisville in the first round before losing to Michigan State two days later. Two March victories over Purdue, which shared the regular-season conference title with Michigan State and fell one game short of the Final Four, solidified an at-large bid in the tournament after a rough stretch in February. The win over Louisville was just the second in the NCAA Tournament by Minnesota since an Elite Eight victory over UCLA in 1997 that was later stripped by the NCAA for an academic fraud scandal. The Gophers won a first-round game in 2013 under coach Tubby Smith, the predecessor to Pitino. If the university were to fire Pitino without cause after next season, the buyout would be $2 million. That figure drops to $1.75 million before April 30, 2021, and $1.5 million before April 30, 2022. If Pitino were to leave for another job, he would owe the university $500,000. His retention bonus schedule was also slightly adjusted, with $100,000 due on April 30, 2020, if he is still at Minnesota, and $400,000 coming on April 30, 2021. From there, the retention bonuses increase by $100,000 per year, with $700,000 due on April 30, 2024, if he is still coaching the Gophers then.